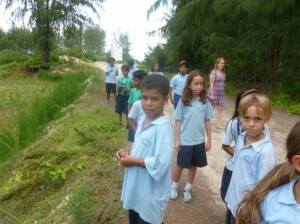 The Junior Wildlife club paid a visit to some new wetlands on Perseverance Island. 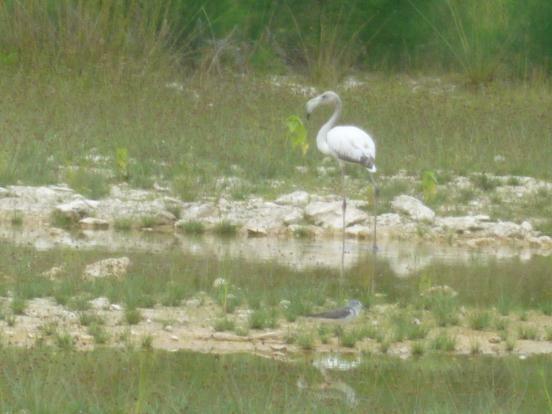 They were lucky to spot the white flamingo there. 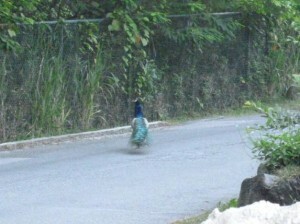 This bird is rarely seen in Seychelles and may have flown off course. Flamingoes do breed on Aldabra and this flamingo probably arrived from there. It may stay until March if the food supplies stay plentiful. The children were excited to try out binoculars to see the great variety of wading birds in the area. Another rare spot by Wildlife club members was a peacock running up the Les Canelles hill. We hope it found its way home! !